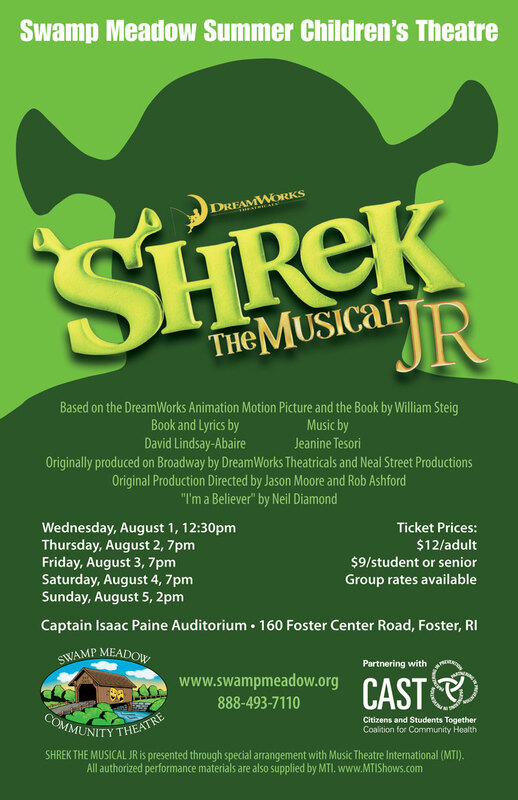 This production opened on August 1, 2018 and closed on August 5, 2018.
adventure with Shrek the Musical, Jr ., the journey of an ogre named Shrek who just wants to be left alone. When Lord Farquaad banishes the fairytale creatures of his kingdom to Shrek’s swamp, Shrek sets out off on a quest with a talking Donkey to fetch the unknown Princess Fiona. In exchange for the princess, Lord Farquaad will return the deed of the swamp to Shrek. As quests often do, this adventures takes a twist — will Shrek go out of his way to save a princess locked in a castle and guarded by a dragon, will he accept the fairytale creatures as his new roommates, or will Shrek complete the quest and deliver the princess to the unsavory hands of Lord Farquaad?